There is this product that I want to share with you. I just think it is a pretty creative accessory in how simple and easy to operate. We all bike because it is convenient and easy, and that is how I perceive this product. It’s called Bike Lift and Carry, created and designed in Ukraine (as you all know, Ukraine is in a civil war with Putin’s pro-Russian separatists) and founded by Henry Teterin, a great guy by the way. It’s a retractable strap that attaches at the seat post and stretches to attach at the handlebar which acts like a shoulder strap. And when you are done, just detach it from the handlebar and it coils back. There’s also a great review written by TreeHuggers. The kickstarter for this project just began a few days ago! If you live in a home that have stairs or you’re a frequent BART commuter, this item should simplify your life. 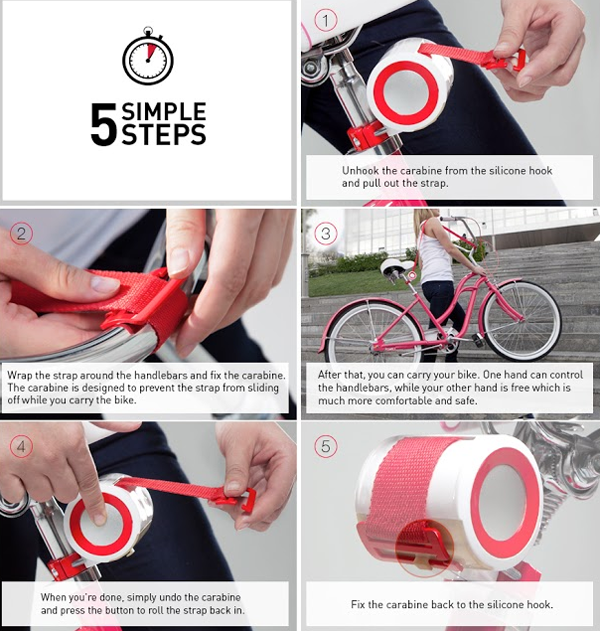 Maybe now, you don’t have to leave your poor bike outside. Or maybe you can now take your bike onto BART or MUNI metro. You don’t have to deal with slow and smelly elevators, and many stations don’t even have them. Many escalators only go up, but not down. The shoulder strap can lift up to 70 lbs or 32 kg, which pretty much can work on any bike. This is great because more and more people are buying heavy urban bikes from makers like PUBLIC and Linus, and electric bikes are gaining popularity, as well. I wonder if this would work on long-tailed cargo bikes though, such as the Yuba and Xtracycle. They come in many colors and should complement SF’s hip bike style! The kickstarter price starts at $45.